QUIET SUN: Just when you thought solar minimum was over... The sun has been blank for nine consecutive days, the longest stretch of spotlessness since 2009. Solar activity is very low and no sunspots are in the offing. "I took the picture using my Canon 10D set at ASA 400 for a few seconds," he says. "What a nice photo-op!" 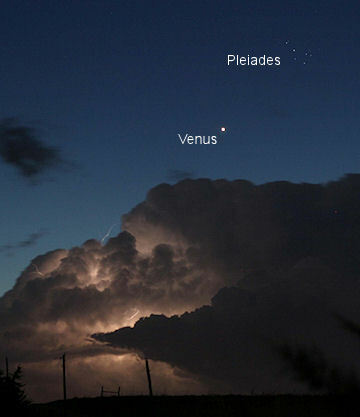 While Venus is easily visible to the unaided eye, even from brightly-lit cities, the Pleiades are more of a challenge. For best results, grab your binoculars and point them at Venus. The star cluster will pop into view only a few degrees from the glaring planet--a dissimilar ensemble you won't want to miss. Sky maps: April 24, 25. MIDNIGHT LIGHTS: A solar wind stream is buffeting Earth's magnetic field and causing auroras around the Arctic Circle. In Alaska, the green lights have been dancing across a canvas of twilight blue. "The sky no longer gets dark here at 65° north," reports LeRoy Zimmerman of Fairbanks. "The northern horizon now has constant light all night long. 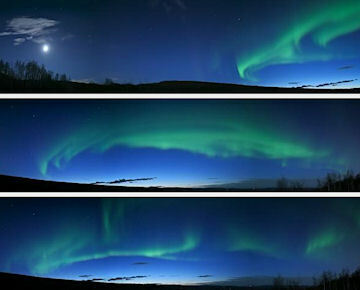 I took these panoramic shots during the midnight hours of April 22nd." "The auroras were soft and quiet, but lovely to watch," he continues. "It's a little sad to have the auroras active again just as we are losing our darkness. I reckon I have only ten more days of photography left before the midnight sun completely spoils the show." "On the bright side," he points out, "it was not cold! I was outdoors from about midnight until 2:00am local time and felt comfortable the whole time." On April 24, 2010 there were 1116 potentially hazardous asteroids.